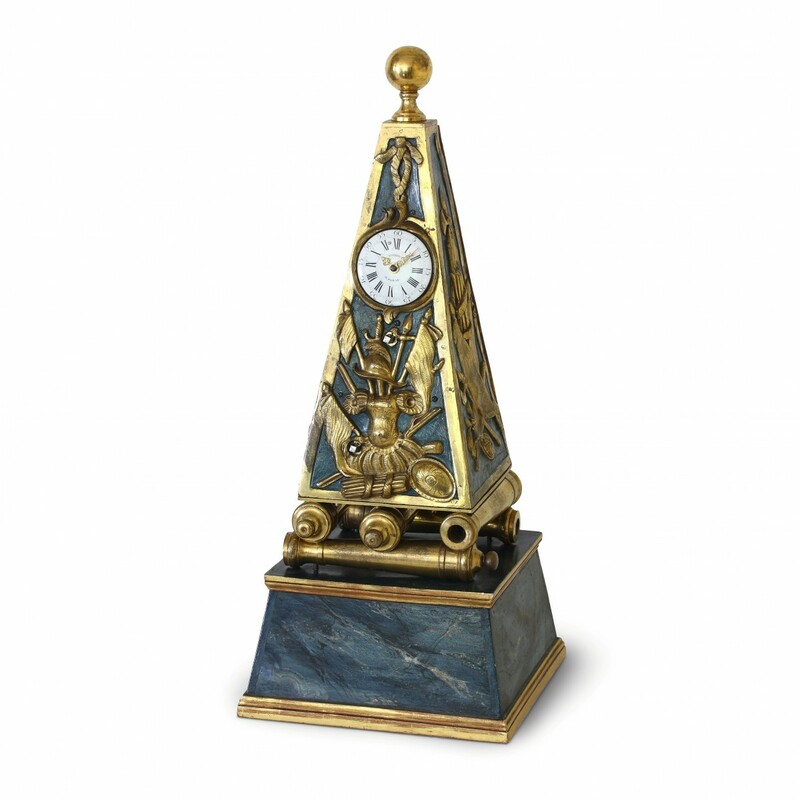 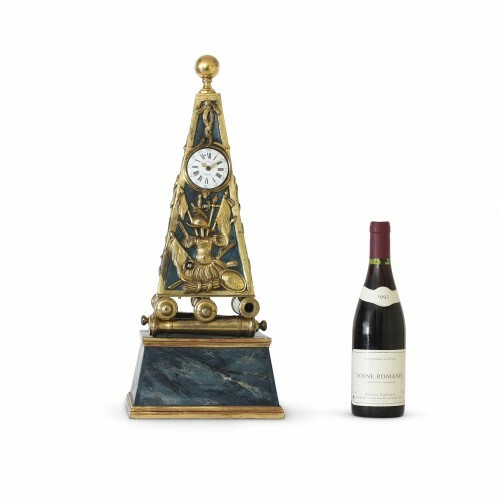 Circa 1760, signed on the dial and on the rear movement plate: THIOUT A PARIS, highly unusual and very rare French “Obelisk” clock with all its military attributes: shell and feathered helmet on a background of trophies of weapons, flags and banners, the sides with a similar décor but without helmet nor shell, a cannonball above and five lying cannons below, on a fluted base. 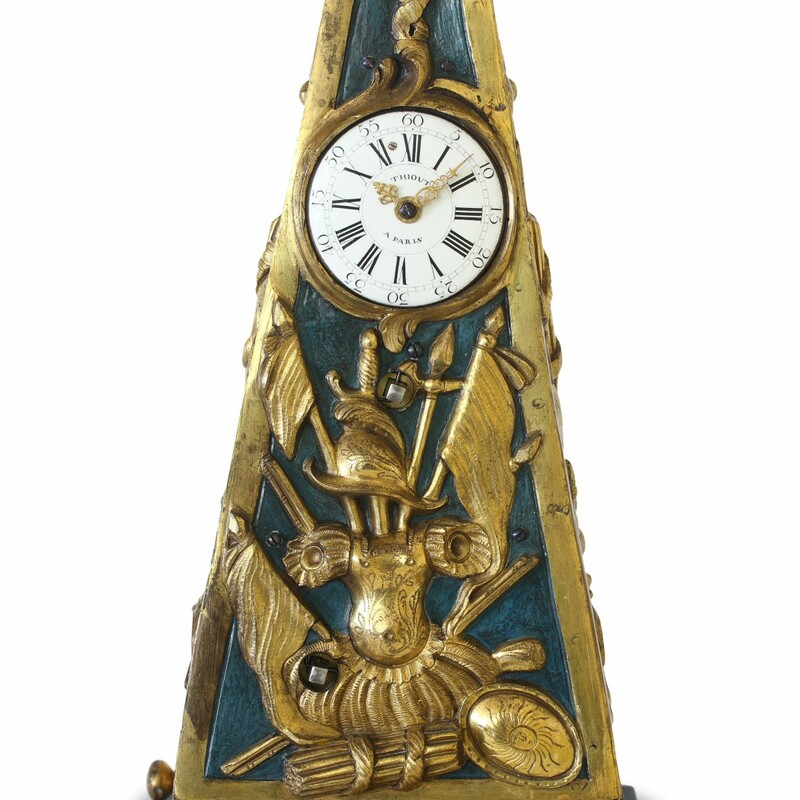 The dial of the clock at the front, and a portrait of a red-haired bearded man with Turkish-style head dress at the rear. 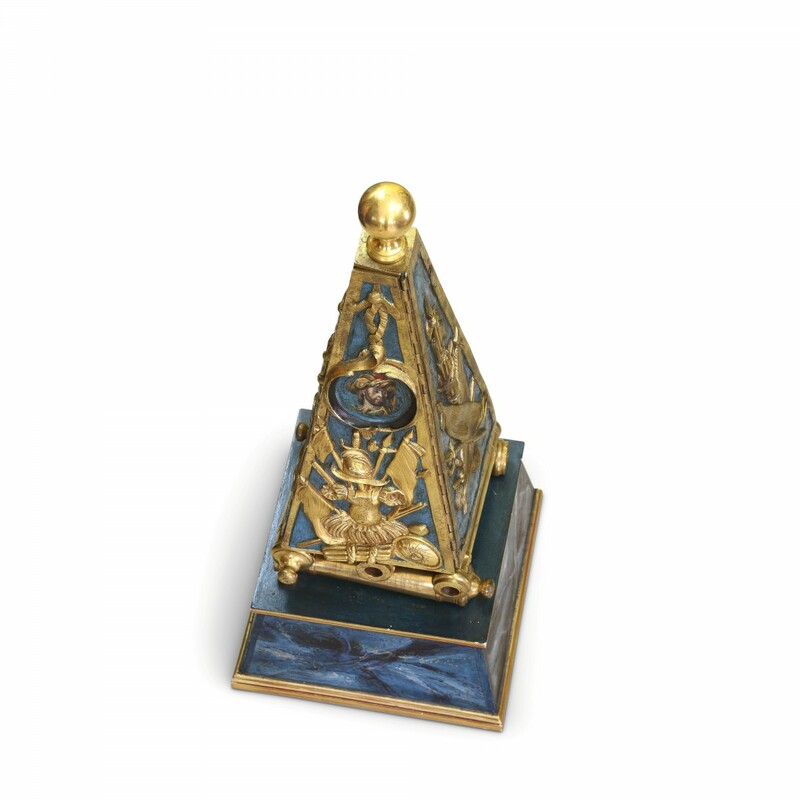 The top cannonball above and the five cannons below in ormolu, the main case in ormolu with painted background, the oak base with faux marble and gilt paint on the edges. 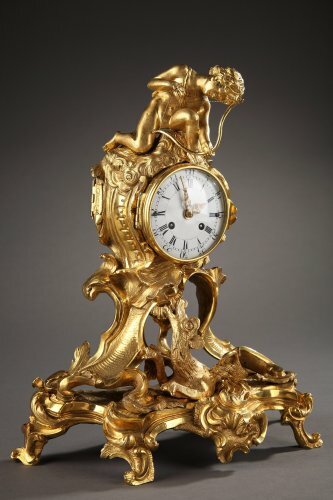 (The wooden base later, probably around 1850). 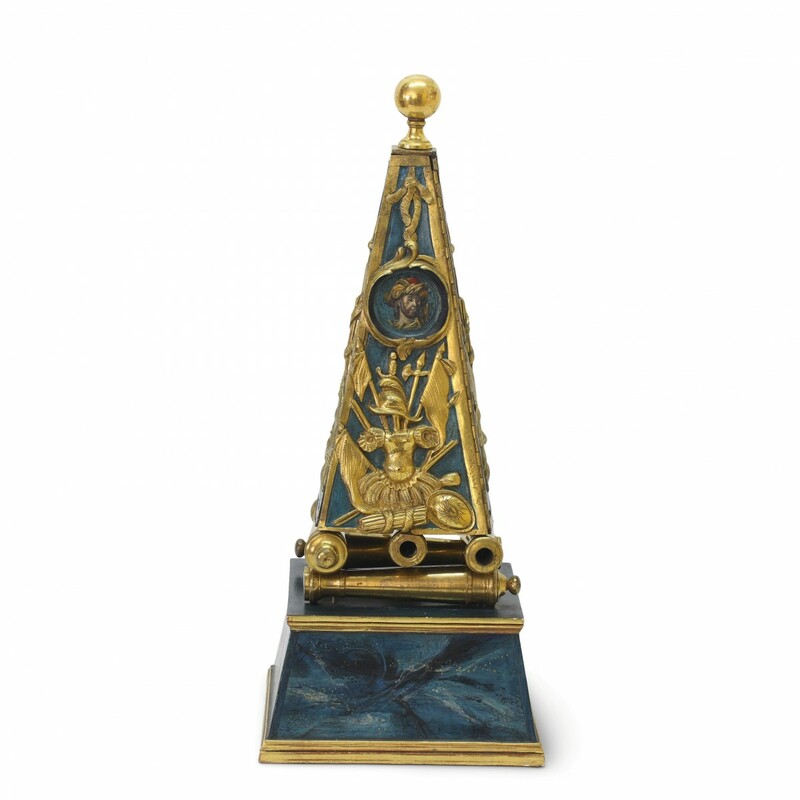 The enamel dial with Roman numerals for the hours and Arabic numerals for the five minutes, with very finely cut and engraved ormolu hands. The movement of triangular shape was specially designed, produced and adapted for this very clock, the verge escapement right on top, the movement above and the countwheel strike below, with a silvered bell and silk suspension. 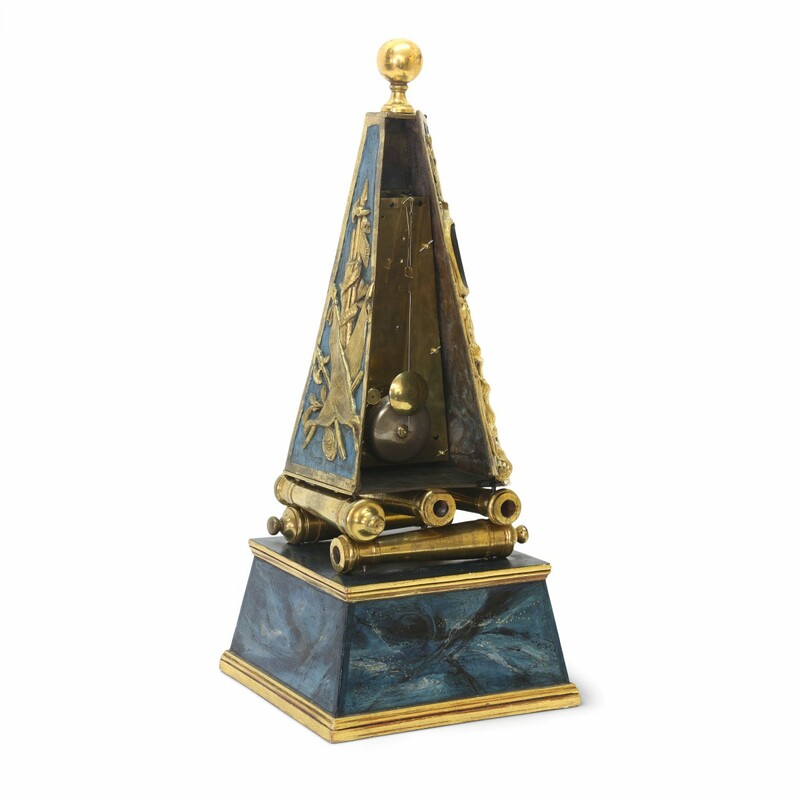 Autonomy three weeks. 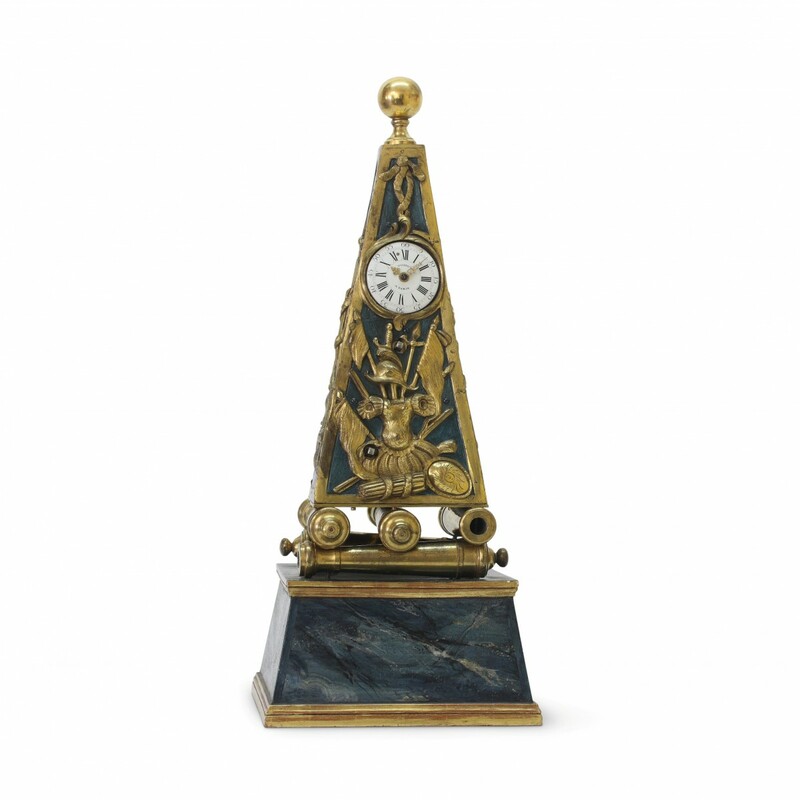 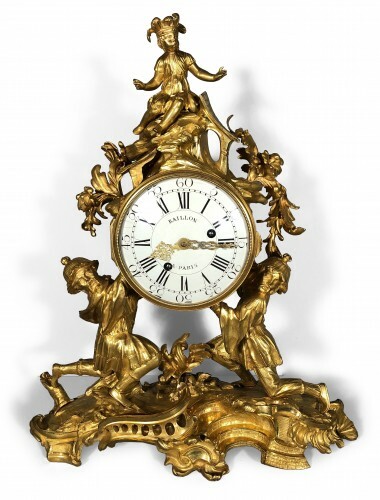 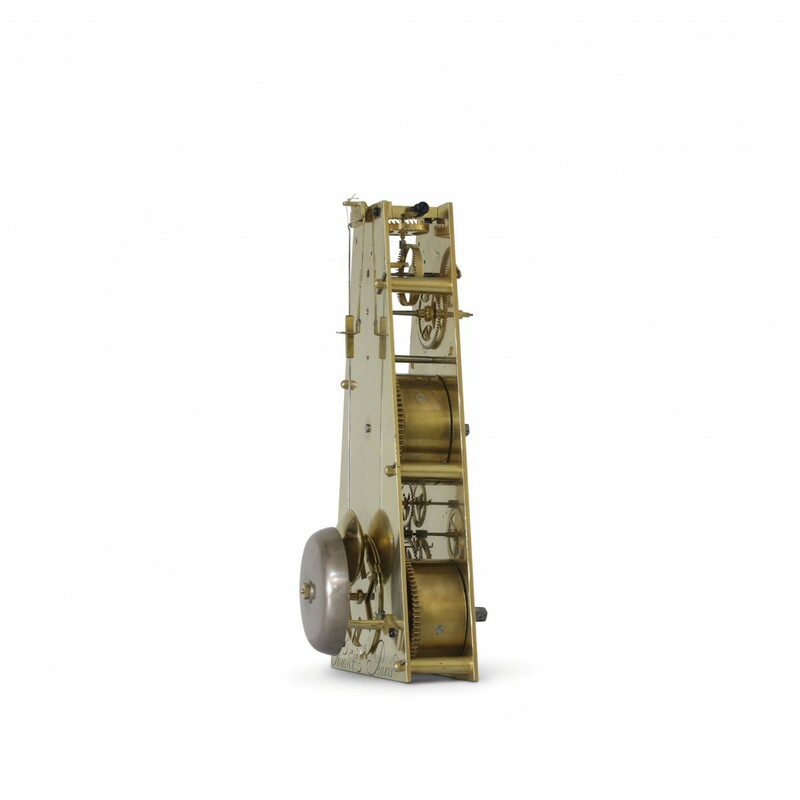 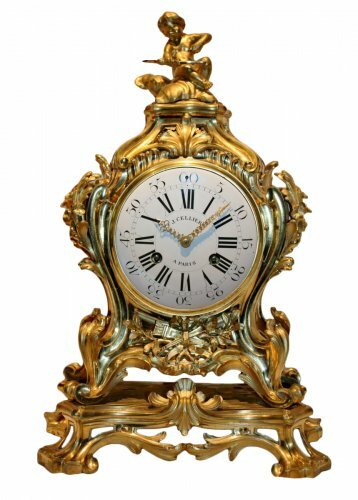 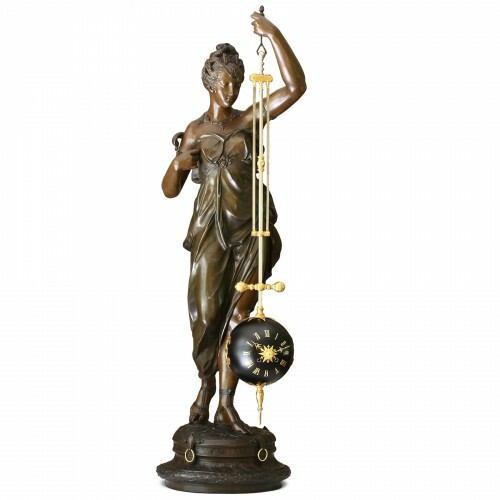 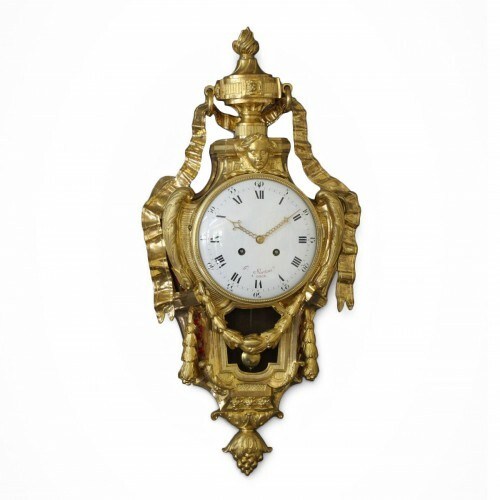 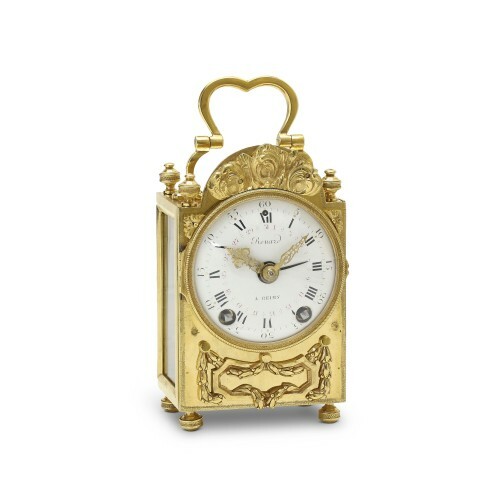 This remarkable clock is very likely unique, bearing all the characteristics of a stand-alone piece: specially designed movement, bearing all the wheel patterns, traces of displacement for better function, the movement mounted and leaning backwards, with the dial being mounted last from the front. Especially ordered as a regiment souvenir for a high-ranking officer, the first owner will remain a mystery. 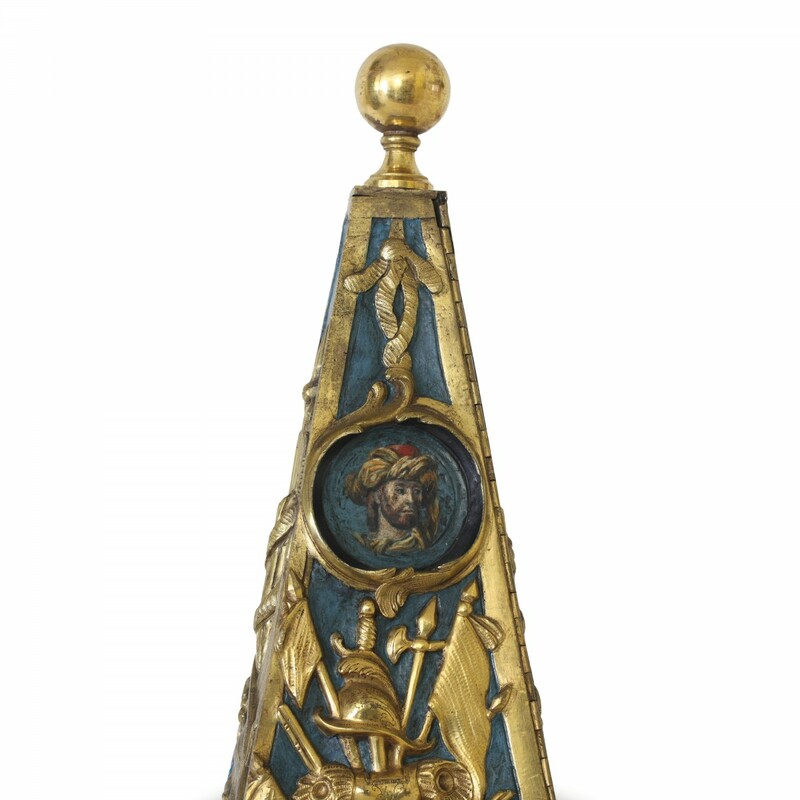 And who is represented on the rear with this “Turkish-style” headdress?